While he is a two-time defending EMass champion, Oosting hasn't had much luck at the state level when it comes to cross-country. Last year he was hampered by an ill-timed sickness and struggled to a sixth-place finish. In 2016, he finished 139th overall. We're guessing things will change in a big way this fall in Oosting;s final season of XC. The Spy Ponders' senior is our pick to win the individual state crown on Nov. 17 and should be among the favorites at the nationals. Right now, he's leaning towards Foot Locker. Oosting is coming off a pair of stellar track seasons on both the indoor and outdoor surfaces. In addition to winning state titles in the mile and two mile, he also clocked a PB of 8:53.46 for the 2M at the Brooks PR Invitational, finished second at the nationals for the deuce during the indoor season and was a runner-up finisher to fellow Bay Stater Andrew Mah of Newton North in the 5K at the New Balance Nationals in June where he ran a near best of 14:37.74. In July, Oosting also was a bronze medalist for 3,000 meters at the European U18 Championships in the Netherlands where he crossed the line in a best of 8:28.22. 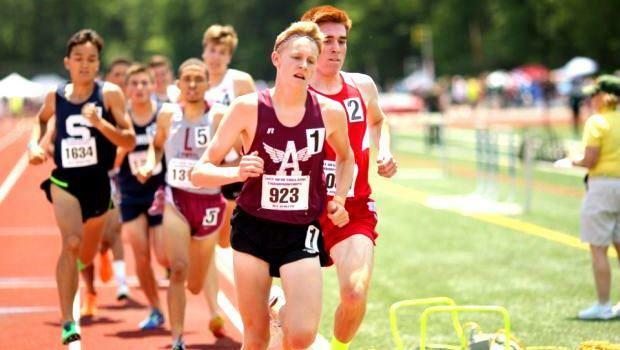 Oosting will have some tough harriers to contend with at the All State Meet, including last year's Nike Cross Nationals' qualifier Lucas Aramburu of Brookline. But a healthy and fit Oosting will be tough to beat. At his best, he's certainly capable of running a low 15-minute time (or faster) at the divisionals in Wrentham.